Alexandra Road Park is a neighbourhood park, located in the heart of the Alexandra and Ainsworth community. It forms a green oasis in a built up urban area of inner London, and is a rare and highly acclaimed example of late 20th Century landscape design. The park is 4 acres in size. Alexandra Road Park is a linear park, which has been structured by a series of diagonal paths which cut across the open space, maximizing use of the space and creating a series of ‘outdoor rooms’ with different characters for relaxation and play. This basic structure is enlivened by a dramatic three-dimensional landscape of ridges and valleys, which create excellent views over the space from raised gardens and plazas, as well as more intimate sunken spaces. The park design incorporates five playgrounds for different age groups, including a multi-use games area; a more formal circular lawn surrounded by mature trees creating an amphitheatre with a concrete ‘stage’; a raised ‘mound’, a south facing sheltered space with benches along the northern edge; and the ‘meadow’ – an informal large grassed area opening directly onto Langtry Walk. In addition planting concepts for the pathways contribute further to the character of the park, for example the ‘country walk’ connecting the meadow to the Tenants Hall is lined with hawthorn reminiscent of field hedgerows, and a grove of silver birch trees and low groundcover creates a dramatic woodland entrance to the park by the Tenants Hall plaza. 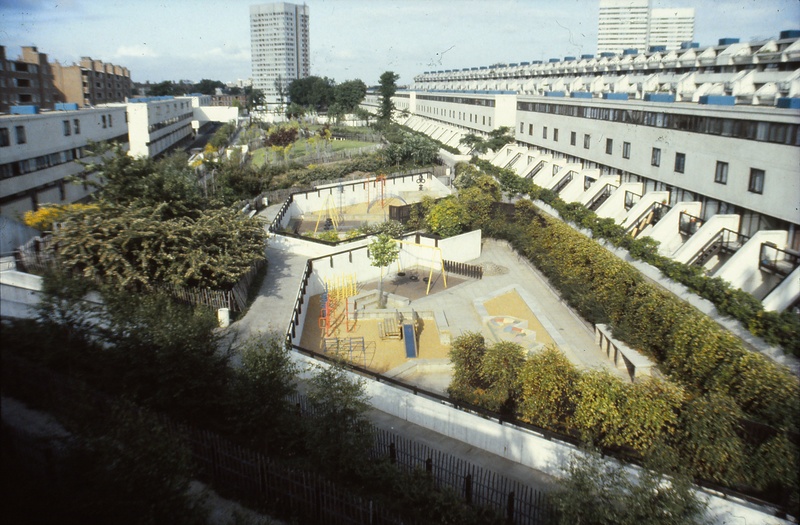 The park, an east-west swathe of green space between two long blocks of the estate was designed by Janet Jack (1972-78) in conjunction with Neave Brown’s new housing. Alexandra Road Park lies within the Alexandra Road Conservation area and forms the setting for the Grade II* listed buildings of the Alexandra and Ainsworth social housing estate designed by Neave Brown (1968-78) for Camden Council. The park cannot be uncoupled from the housing and together they are a highly valued example of landscaping and architecture from the period of rebuilding (1960s/70s) of post-war London.